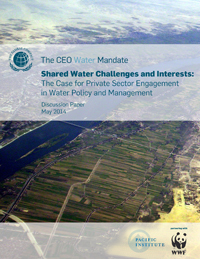 A new discussion paper from the CEO Water Mandate and WWF makes the case for private sector engagement in water policy – responding to the question of whether such strategies truly advance the public interest. Industry relies on fresh water directly to manufacture goods and indirectly in the production of supplies. Reducing business risk by supporting a stable business environment and ensuring consistent access to water supplies strengthens a company’s license to operate and builds its standing among relevant stakeholders. But these efforts also seek to advance sustainable water management and identify and reduce the company’s adverse impacts on a region’s water-related challenges. Such efforts are grounded in the premise that they advance the public interest and are mutually beneficial to companies, their stakeholders, and other actors in the watershed. The UN Global Compact’s CEO Water Mandate is committed to achieving sustainable and effective water management, recognizing that private sector participation that reinforces and complements the work of traditional state actors can be a powerful tool in the quest to achieve water security, on the local and global levels. Some NGOs and academics argue that business strategies in water management can perpetuate a history of undue corporate influence on public policy that subverts the public interest in favor of corporate profit. The new paper acknowledges this potential, but also asserts that private sector engagement can be a force for good, as well, if conducted in a transparent way that advances the public interest and aligns with global sustainable development goals. The discussion paper, Shared Water Challenges and Interests: The Case for Private Sector Engagement in Water Policy and Management, posits that discouraging or preventing companies from contributing to sustainable water management in cases where they have a clear and demonstrable interest in doing so, and where they have access to vast resources that would not otherwise be available, is actually a significant detriment and threat to effective water governance, sustainable development, and economic growth. Many water-related risks, such as scarcity, pollution, inadequate infrastructure, insufficient management capacity, and climate change, affect a wide range of actors and are shared among companies, governments, civil society, communities, and others. Societal expectations for corporate sustainability, including efficient and responsible water-related policies and practices, are on the rise. Water-related development challenges, together with the changing landscape of stakeholder expectations, are creating very real economic incentives for companies to behave in a manner that is deemed responsible. Although companies could consider strict regulations that limit their activities a business risk, in reality, water-intensive companies are also negatively affected by a lack of regulation on other actors in their watershed – a lack that eventually leads to the depletion or degradation of a shared resource. A tenet of the CEO Water Mandate is that sustainable water management can only be achieved through robust public water governance, which includes effective regulation of corporate practices. Regulation that is coherent and consistently applied is positive for society and ultimately reduces risk to business. The paper’s call to action is for processes that can shed light on unsustainable practices where they exist, highlight examples of beneficial corporate action, and ultimately help determine the most appropriate role for the private sector in addressing our shared 21st Century water challenges.